There is a very active competitive shooting community in Southern California. In addition to the matches run by the Oceanside Practical Pistol Club many other local clubs hold regularly scheduled matches. Use the links below to learn more about the types of matches we hold, or to learn more about other matches in the area. We try and keep our event calendar up to date with all local events of interest, if you know of a local event that isn't listed drop us a line and let us know about it. Recent match scores are available directly from the menu bar at the top of every web page at www.oceansidepistol.com, or click here to go directly to the online score sheets. The club also maintains a low-volume mailing list that can notify when new scores have been posted or when there is a scheduling change. The club owns a large (and ever growing) variety of props that allow for a wide variety of shooting scenarios. In addition to standard steel targets and a wide range of cardboard target stands we have a free-standing doorway, 8 free-standing wall segments, many smaller wall segments, drop-turner and swinging targets, more than a dozen barrels. A more complete list can be found on our props page. Match Description - Our matches are held on Sunday mornings and Thursday evenings. We run a variety of match types, including IDPA, USPSA (IPSC), steel and more. 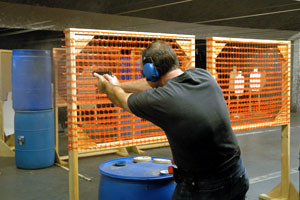 Other Area Matches - There are plenty of other shooting matches are held all over Southern California. You can learn more about them, including contact info, here. Frequently Asked Questions - Got a question? You're probably not the first person to ask it, but if you are we'll be sure to give you credit in the FAQ. New Shooters - Interested in coming out for a match? Here's some info to get you ready including safety, equipment requirements, match sign up, and fees. Club Props - Thinking of designing some stages? We'd love to hear your ideas. This page lists the current club props available to stage designers. IDPA Classifier - The IDPA Classifier course of fire and tips on how to shoot it well. USPSA Scoring Web Software - Get a free copy of the USPSA web scoring software we use for your club's website. For upcoming events please go to our online event calendar. Visit the calendar for more info.